SRC Worldwide SRC, headquartered in Cleveland, Ohio, is the sole United States producer of premium low-moisture anhydrous magnesium chloride and fused flux, as well as blended magnesium flux. MelCap Partners acted as the investment banker and financial advisor to SRC Worldwide, Debtor-in-Possession, in this sale transaction under §363 of the Chapter 11 Bankruptcy Code. 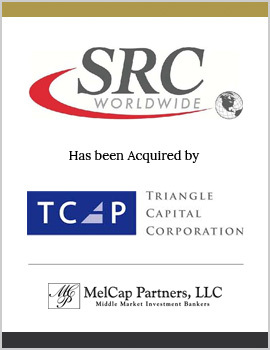 SRC Worldwide was sold to Triangle Capital Corporation (NYSE:TCAP).